Julia Hawkins took up running when she was a hundred years old. 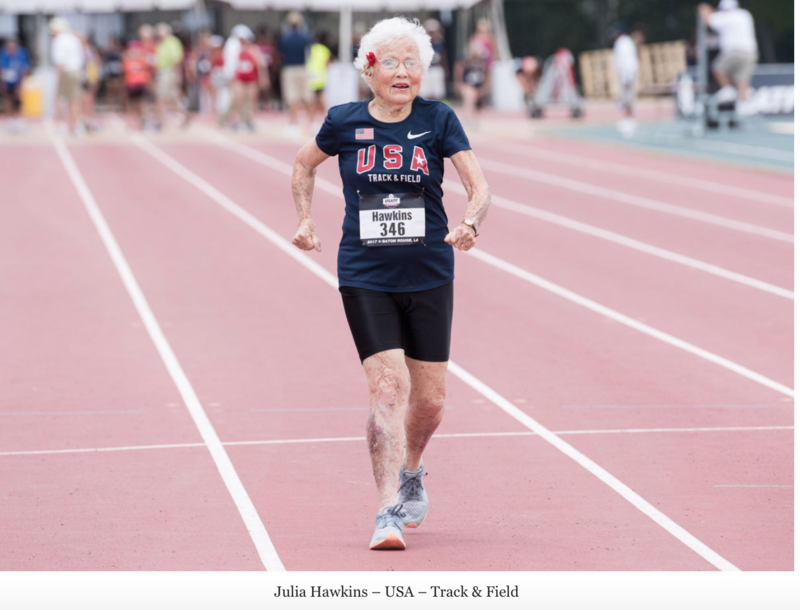 On July 15, 2017, Julia Hawkins, aged 101, became the oldest female athlete to ever compete in the USA Track and Field Outdoors Masters Championships. Her time for the 100 m was 40.12 seconds, shaving six seconds off the current record for women aged 100 and over. This wasn’t her personal best. Earlier the month she ran a time of 39.62 seconds in Birmingham, Alabama. She took up the sport, Track, and Field, only last year. Her first qualifying run was a 50-meter run last year. Seeing this, her children immediately signed her up for the 100-meter dash. If these times get certified in December, she will be the official world record holder. Julia Hawkins has always cycled but took up competitive cycling at 75. After a few years, she gave up on the competitive cycling because there were no women to compete against. It was no fun! Hawkins’s slight frame stands only five feet tall. She is a retired teacher. Born in 1916, she married her college sweetheart. They wed by phone while he was away at Pearl Harbor in 1941. She gave herself a wedding present: a bicycle! She lives in Baton Rouge, Louisiana, in a house she and her late husband built in the 1940s. Murray passed away in 2013, at the age of 95. The couple has four children in their late sixties and early seventies. 1 | You are never too old to learn something new. Age does not define us. Julia Hawkins took up Track and Field when she was a hundred years old. She took up competitive cycling at 75. 2 | Don’t be afraid to challenge yourself. Believe in yourself. Push yourself. 3 | A positive outlook on life makes all the difference. Stay busy. Be involved in your community. 5 | Laughter is good medicine. A sense of humor prolongs your life. She remained married to her college-sweetheart for 70 years. “Marry a good man,” she advises. When the children signed her up for the 100-m run, after her first qualifying 50-m, she accepted the challenge! Let us nourish and work harder on our relationships with friends and loved ones. 7 | Gardening can help you live to a hundred and be a champion on the track! Julia Hawkins takes care of her vast garden with flowering plums, paper birch, numerous bonsais with countless footbridges and bird feeders. Julia Hawkins, a former teacher, lived an ordinary life, taking care of herself, her family, her garden, and her community. She continues to impact those she meets with her enthusiasm, passion, and positive outlook. Master new competencies—irrespective of your age. Live your ordinary life. You will inspire others. Julia Hawkins has joined the distinguished ranks of centenarians, like Mr. Robert Marchand, the 105-year-old cyclist from Paris, who don’t allow age to define them or slow them down. They are ordinary people that show up and do the work, how insignificant it may seem. How about you? What (ordinary) thing are you doing that can inspire others?